Are you ready for some boxing? A promo card for PBC’s first NBC bout. After a nearly 20-year absence from primetime, professional boxing returned to broadcast network prime-time Saturday night, thanks to boxing promoter Al Heymon and his newly created Premier Boxing Champions. 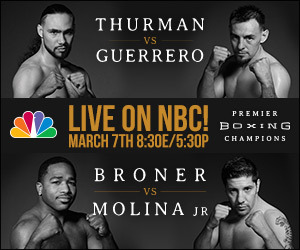 The boxing schedule struck time-buy deals with NBC, CBS, and Spike TV for bouts, and the first of them came March 7 with Adrien Broner facing off against John Molina Jr., and Robert Guerrero fighting Rick Thurman. The event was held at the MGM Grand in Las Vegas, the site of the biggest boxing event since Muhammad Ali-Joe Fraizer: Floyd Mayweather Jr. (who is managed by Haymon) and Manny Pacquiao, scheduled to take place on May 2. The return comes at a time the sport is trying to spark a resurgence after years of decline. Boxing programs were a weekly staple in the early days of television; weekly shows included CBS’ Pabst Blue Ribbon Bouts and ABC’s long-running Fight Of The Week. The sport’s popularity on TV took a serious downturn when Benny “The Kid” Parret was defeated for the welterweight championship on FOTW in March 1962 and was carried unconscious from the ring. He died from his injuries a short time later, and after a huge ratings decline, ABC canceled the show in September 1964. The PBC event was presented by Corona Beer; future telecasts are expected to have sponsors looking to appeal to the 18-49 and 25-54 male demo (such as energy drinks and financial companies.) With the estimated $20 million time-buy deal, NBC and sister cable net NBC SN plan to present twenty live boxing matches in 2015, while CBS plans to carry several Saturday afternoon bouts. Spike TV also plans to carry a few matches. Saturday night’s matchup on NBC averaged a 2.5 household overnight rating and a 2.1 final rating, marking the highest rating for a boxing bout on broadcast TV since De La Hoya’s fight in 1998; and drew a 1.1 in the adult 18-49 demographic. The special drew 3.4 million total viewers, peaking at 4.2 million for the Guerrero-Thurman fight. NBC’s last primetime bout on Monday May 20, 1985 scored a 18.5 household rating/29 share, finishing second in its time period (behind ABC’s successful two-part mini-series Deadly Intentions and ahead of CBS’ two-part mini-series flop Christopher Columbus) and sixth overall for the week. The matches were a mixed bag – the first one between Broner and Molina featured a lot of clutching and grabbing and not a lot of boxing, which doesn’t really make good TV. Broner (whose brash personality is wearing thin with a few boxing fans – he was booed mercilessly ) beat Molina in a twelve-round unanimous decision. The second bout between Guerrero (who faced Pacquiao in his last fight) and Thurman was more exciting; after twelve rounds, Thurman was declared the winner, also in an unanimous decision. In all, Haymon’s new project has gotten off to a decent start, with solid production values. NBC’s next primetime boxing special is scheduled for April 11 in Brooklyn’s Barclays Center while CBS’ first PBC telecast takes place Saturday afternoon, April 4.